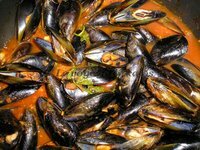 Since we are on the topic of chilli mussels, let me just share with you my “adventures” of it while I was in Perth. 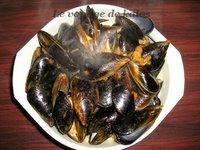 While thinking that cooking chilli mussels is not that too daunting a task, I proceeded to try my hands on it. I was right about the cooking part, but I failed to foresee the preparation part of it. You see - mussels that are purchased off the market usually come with “beard” (i.e. the seaweed that mussels clinged on to). And it takes time to clear these beards and cleaning the shells. My personal experience tells me that it takes 45 minutes to an hour to clean up a kilogram of these. Anyway I have here my very own recipe and one of my proudest achievements in gourmet preparation. * Preheat a heavy based pot on low heat for a few minutes. * Brush base lightly with olive oil. Gently cook garlic for 1 minute. * Add tomatoes, wine and chilli. Increase heat to medium. * Bring to the boil. Reduce heat to low and simmer for 10 to 15 minutes or until tomatoes are mushy. * Increase heat to medium. Add mussels and spring onions. Cook for 3 to 5 minutes or until mussels open. * Discard any which remain closed. Sprinkle with parsley. * Serve with crusty Italian bread to mop up the sauce.